If you want to help by writing a letter in support of Rev. Pinkney, instructions can be found near the end of this message. Please forward this message all over the country and the planet. Anyone and everyone can help. This is one of the most important class/corporate struggles in the US. And media will not touch it. On March 21, 2007 (when day and night are equal), justice in Berrien County, Michigan, took a big step backwards into the darkness of fear and bigotry when an all-white jury convicted a black community activist, Reverend Edward Pinkney, of five counts of improprieties in connection with a 2005 recall election involving the City of Benton Harbor's most powerful commissioner. The facts and the history are stark. Benton Harbor is ninety-four percent (94%) black, ninety percent (90%) poor and seventy percent (70%) unemployed. It is directly across the river from affluent and practically all-white St. Joseph, Michigan, the world headquarters of the Whirlpool Corporation. Benton Harbor is still the largest city in the county and was once the site of most of the county's governmental functions, including the Federal building. But, as industrial stagnation and flight increasingly gripped the area and the St. Joseph/Lake Michigan coastline was increasingly dominated by the tourist economy, Benton Harbor has been systematically drained of any economic vitality. Its citizens are unwelcome in other parts of the county and the criminal justice system operates to arrest, imprison, intimidate, control and marginalize them. Benton Harbor's governmental and educational institutions are characterized by infighting and petty corruption. The City festered in that condition until the summer of 2003, when the police killing of a young black man erupted into a short and destructive outburst of rebellious anger. 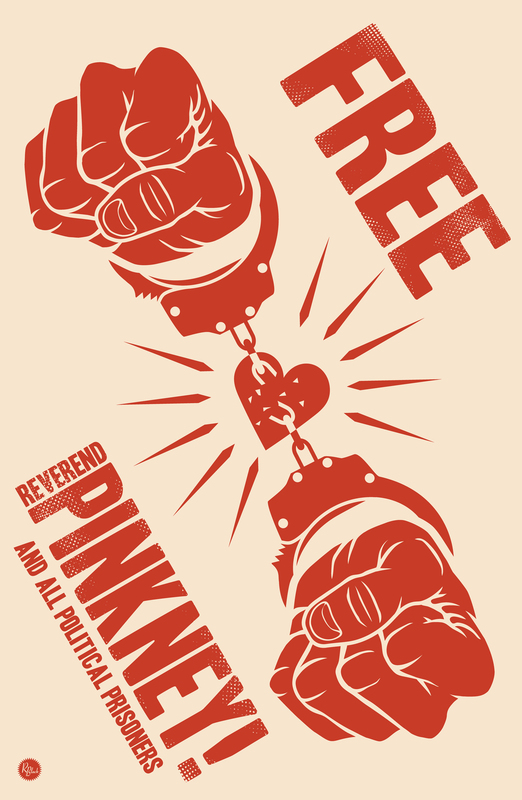 Pinkney helped keep the peace. Public officials poured in to deplore Benton Harbor's conditions and promised that something would be done. Nothing was. Progressive and radical organizations also went to Benton Harbor and linked up with the local community. 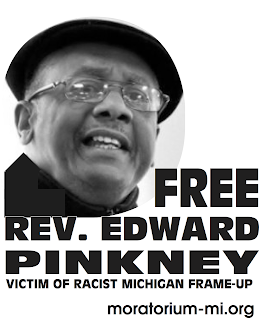 The Reverend Edward Pinkney, working in cooperation with his wife, Dorothy, had affiliated with BANCO (Black Autonomy Network of Community Organizations) and had meetings in Benton Harbor. By the time of the 2003 rebellion, Pinkney was publicly identified as the leader of the disadvantaged and dissident community in Benton Harbor, based in large part on his daily presence at the Berrien County courthouse. He exposed what he saw as the inherent racism of the criminal justice system and the willful inadequacy of the defense provided to the poor (mostly) black defendants. Pinkney picketed the courthouse and the local newspaper, openly naming individuals he believed to be involved in corrupt and racist practices. In the fall of 2003, in a notorious incident, the Benton Harbor Chief of Police (who was not a certified law enforcement officer or licensed to carry a gun), fired into the air in order to disperse a group of black youths who had gathered on a corner. Despite the fact that both the possession and the use of the gun were illegal under state and local law, nothing was done. Pinkney led protests. The primary protector of the Police Chief was a City Commissioner named Glen Yarbrough, who was and is the most powerful political figure in Benton Harbor. Although the transition of Berrien County from an industrial to a tourist, real estate and service-based economy increasingly isolated Benton Harbor, it sits on some very valuable real estate on the St. Joseph River. In 2003-2004, the former CEO of Whirlpool began advocating a development plan for what was projected to become a five hundred million dollar ($500,000,000) marina/residential/golf course complex, which would take four hundred sixty five (465) acres of Benton Harbor. It would take the City's only beach and the City would be paid less than a million dollars ($1,000,000) for the property. Ultimately, it is projected that the land will be detached from the City and put in the more-white adjoining township. BANCO and Pinkney opposed this development because it would do nothing for the poor and permanently deprive the City of some of its potentially greatest assets. Commissioner Yarbrough was the key local politician supporting the plan. In the fall of 2004, Pinkney and BANCO circulated recall petitions for Yarbrough, using his failure to discipline the Police Chief as the reason. Once the recall election was put on the ballot for February 2005, Pinkney used his grassroots and BANCO network to get out the absentee vote. He knew that, with his limited resources, he could never hope to compete with the Yarbrough "machine" on Election Day. Pinkney was successful. There was a forty-two percent (42%) absentee voter rate and Yarbrough lost the recall by fifty-four (54) votes. Yarbrough immediately swung into action. He went to the County Clerk complaining about the absentee votes. She referred him to the Prosecutor, who personally called the Sheriff to have an investigation opened. Within days, Yarbrough had "found" a young man named Mancel Williams, who alleged that Pinkney paid him $5.00 to vote for the recall. A week later the same Mancel Williams went to City Commissioner Etta Harper and made a tape recording, indicating that Yarbrough had paid him $10.00 to claim that Pinkney had paid him $5.00. The tape was turned over to Mayor Wilce Cook, who turned it over to the Benton Harbor Police. Nothing happened. The County Sheriff's investigation did not mention it. Mancel Williams is in prison on another charge and has refused to testify for either side, fearing retaliation by the police and prosecutor. Brenda Fox, a drug-user and prostitute whom Pinkney had helped in the past, was interviewed by the police, who were working off the absentee voter list. The day before the election, she had volunteered to go to the local soup kitchen and recruit 10-15 people for $5.00 each to pass out leaflets about the election the next day. It turned out that a number of the clients of the soup kitchen were registered to vote and wanted to do so. They went to the Clerk's Office, got absentee ballots and voted. Brenda Fox, under pressure, claimed that Pinkney had told her to pay them $5.00 to vote against Yarbrough and make sure that they did so. She was given immunity from prosecution. None of the people who supposedly got paid to vote admitted it or testified against Pinkney. A number of witnesses denied the $5-a-vote claim by Brenda Fox, supporting Pinkney. They passed out fliers. But Brenda Fox's most important task was to testify in the lawsuit filed by the Prosecutor against the City Clerk to set aside the recall. The City refused to defend her. Although there was not enough evidence to invalidate 54 votes, a local judge, now nominated by George Bush to the Federal bench in Western Michigan, ordered a new election. The clerk lost her job. The next day the Prosecutor arrested Pinkney for voter fraud and hit him with a $100,000 bond. Although Pinkney's bond was reduced and he was later released, Yarbrough was reinstated to the Commission in the second recall election. Obviously Pinkney, facing charges and with his supporters intimidated, still campaigned valiantly but was unable to overcome the resources poured in by the local establishment. The vote was down and Yarbrough won by 40. For three days after she testified in the election lawsuit, Brenda Fox holed up in her apartment sending people out for drugs and alcohol, indicating that the money came from testifying against Pinkney. She told one witness, Douglas Bragg, that he was the only one not getting paid to testify against Pinkney. A year later, Bragg saw her get picked up for prostitution by the Benton Harbor Police and then dropped off 20 minutes later. She said that she did not have to worry about the police as long as she was testifying against Pinkney. The Judge refused to let most of that evidence into the trial. In Pinkney's most recent trial, Brenda Fox, under questioning by one of Pinkney's lawyers, Elliott Hall (former counsel to the Detroit NAACP, Vice-President of Ford Motor Company and Chief Assistant of Wayne County Prosecutor), broke down completely on the stand, began crying and could not go on. She was described by Hugh [Buck] Davis (a veteran civil rights lawyer) as incredible as any witness he had seen in 38 years. Davis told the jury in closing argument, "You couldn't send a dog to the pound on the testimony of Brenda Fox." Nevertheless, the all white jury convicted Pinkney of paying for and influencing votes through Brenda Fox, shocking the audience and arguably surprising even the Prosecutor. When the jury convicted Pinkney on the false vote counts based on the testimony of Brenda Fox, Davis commented that the willingness of the jury to find guilt beyond a reasonable doubt relying on her testimony was an indication that they violated the sanctity of their oath and were motivated by something other than the pursuit of truth and justice. But the most dangerous charges against Pinkney did not concern corruptly buying or influencing votes, but simply inadvertently having possession of an absentee ballot (voted or unvoted) of a person who was not a family member or a member of his immediate household. The Michigan Legislature passed that new law in 1995. In essence, it is a "gotcha" law. The mere allegation that an individual handled an absentee ballot (even with no bad intent or evidence of tampering) is a five (5) year felony. The Prosecutor brought three (3) such charges against Pinkney, giving the jury the option of eight (8) different voters who claimed they turned their ballots over to Pinkney. Pinkney admitted that he gave those voters stamps and address labels to mail their ballots, but did not handle them. He knew that they were so poor that they might not have postage. The Prosecutor admitted that Pinkney gave them the stamps. The defense asked, "If Pinkney was going to take the ballots, why give them stamps?" In the first trial in March 2006, Tat Parish (an able and progressive Berrien County attorney) represented Pinkney. There were two (2) blacks on the jury. The jury hung on all five (5) counts. Given the fact that the Prosecutor had already set aside the election, gotten Yarbrough back in office and gotten rid of a City Clerk believed to be friendly to Pinkney, they might have been satisfied. But Pinkney's militance and outspoken opposition to the administration in Benton Harbor and to the proposed "Harbor Shores" development required that he be distracted by having to continue to defend himself and, if possible, removed as a leader. Defense attorneys, Hall and Davis, long associates in civil rights cases in Detroit, volunteered for the second trial as a National Lawyers Guild project. Pinkney inspired substantial publicity and support, particularly in Michigan, but also nationally. Timothy Holloway (an appellate specialist) also volunteered and wrote a motion and brief attacking the "possession of an absentee ballot" statute on the grounds that it is unconstitutional to create a strict liability felony where the act itself is only handling someone's ballot without tampering and without knowledge or bad intent. The Judge denied the motion. Pinkney attempted to appeal before trial. The Court of Appeals would not hear the case. It is now one of the major issues on appeal. Secondarily, Pinkney had complained for years about the systematic exclusion and under-representation of black jurors in the Berrien County court system. Pinkney, several of his courthouse observers and his original attorney filed affidavits indicating that out of an average panel of potential jurors, rarely were more than 2 or 3 minorities among them (3-5%). Frequently, there were none. 5. Treating one-time absentee voters as permanent exemptions. The Clerk testified without any documentation, that approximately 6 out of every 45 potential jurors in the pools were black, bringing the percentage to a constitutionally permissible 12-13 percent. In fact, she testified that there were 6 blacks in the jury pool called for that very day, March 6, 2007. Unfortunately for the Clerk, Pinkney's court-watchers were in the hall when that panel was escorted to another courtroom. There were indeed 45 potential jurors, but only 2 of them were black (4%). Their affidavits were filed with Pinkney's Judge, alleging perjury by the Clerk. He ignored them. He denied the jury challenge on the first day of the trial, but by the end of the trial had not issued a written opinion. That will be another basis for the appeal. When Pinkney's second jury turned out to be all white, there was some hope that the liberal sentiments of the white community to defend the rights of minorities could be aroused. But the jury was clearly intimidated by the large numbers of Pinkney supporters in the courtroom and around the courthouse, most of them obviously poor. A posting to the BANCO website from a supporter was monitored by the authorities. The e-mailer regretted that he had been out of town during the first part of the trial and commented that the white judge and prosecutor would eventually "go down." It was treated as a threat and turned over to the police. Midway through the trial, the Judge locked the courtroom to spectators, who could only come in before the session began or on break. A juror reported that she thought she had seen an illegal transaction take place in the parking lot between one of Pinkney's lawyers and one of his witnesses and supporters (the lawyer gave him a cigarette). Security was increasingly beefed up. The jury wanted to make sure that Pinkney's lawyers did not have their jury questionnaires. They were returned before the verdict. The effect of all of the above was to make the jury even more afraid and suspicious of blacks in Benton Harbor in general and of Pinkney and his supporters in particular. Their reaction was to retreat into the sort of blind desire to uphold the system as in the South, where a black man's word meant nothing, regardless of how obviously false and fabricated the evidence against him. But it should also be pointed out that these jurors were ordinary working class and middle class whites, themselves on the edge of economic insecurity. As the economy of Berrien County continues to decline, they needed to believe that what has happened to Benton Harbor will not happen to them. They needed to believe that what is good for Whirlpool is good for them. They needed to believe that somehow the "Harbor Shores" development for rich people from somewhere else will be good for them. They failed to understand that they are one layoff, one injury or one illness from needing the same social services as the people in Benton Harbor. They failed to understand that the campaign for universal health care, education, productive jobs, limited development, protection of the environment, etc., can only be achieved when they unite around the protection of the poorest and most dispossessed, as opposed to running away from the obvious horror of life in Benton Harbor. Pinkney's sentencing is May 14, 2007, at 1:30 p.m. Between now and then, all fair-minded individuals, particularly those who have had the privilege to meet Reverend Pinkney or follow his work, should write letters of support.